Several years ago on a rare trip to London, I struggled to tell an acquaintance about an idea I had for a project based in Glasgow. I had only a loose notion – possibly some kind of film, possibly a piece of writing – about my love/hate relationship with my home city. At that time my Garnethill flat overlooked the middens behind a Hill Street tenement and my thoughts towards the city were dark. It’s about murder and architecture, I told my friend, unaware of my choice of words. Not death, but murder. 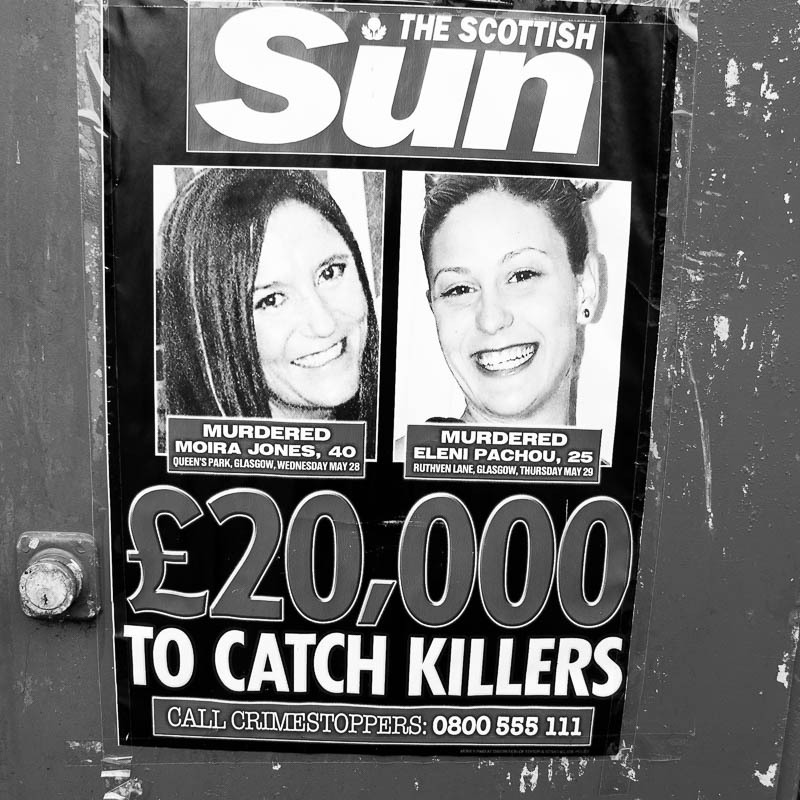 Since returning to live in Glasgow barely a month ago, I’m disquieted by the murder of Moira Jones. 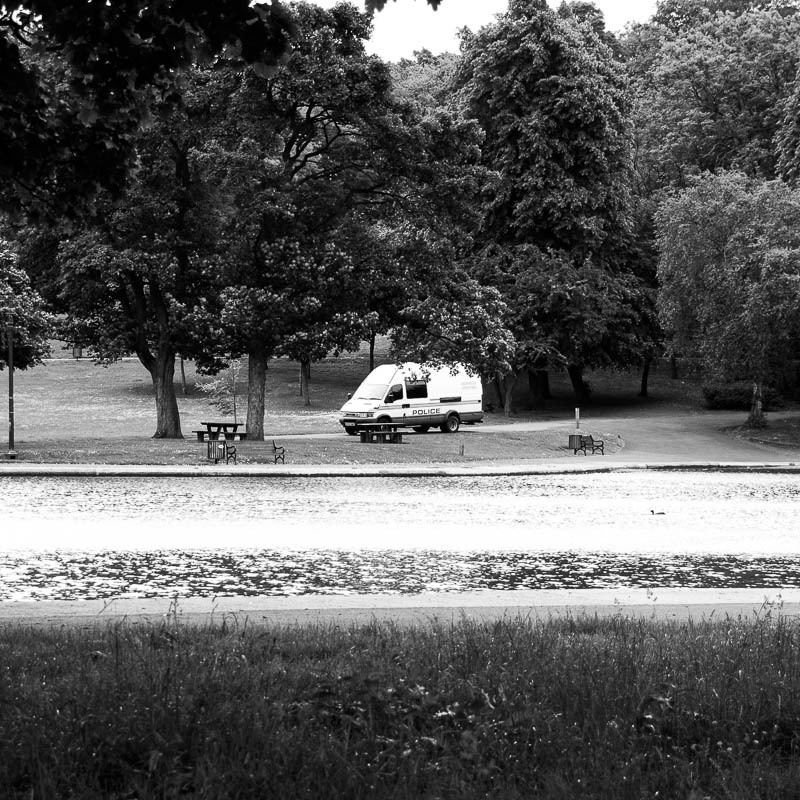 Shortly before her body was discovered among bushes close to the long-demolished bandstand in Queen’s Park, roughly 300 yards from her home, I made several visits to the park to shoot video material for this project. At time of writing, the park remains closed while Strathclyde Police conducts its largest investigation since the attempted bombing of Glasgow Airport last June. It’s been over a week now. Two nights before the crime was committed, while in the park, I chanced on a dead magpie. One for sorrow, I told myself, in that involuntary way your mind forges connections when confronted with a sight as deeply symbolic as a dead bird. My interest in the murder of Moira Jones? Proximity. I live a scarily short distance from the scene of the crime. That, and the 24 hour-a-day police presence has given me pause for reflection on its impact. 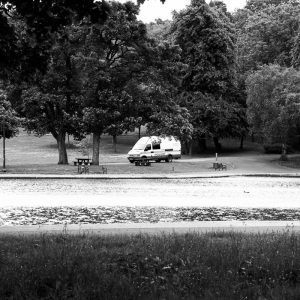 Walking the park’s perimeter, I note the inevitable floral tributes, the Portakabins set up as incident rooms, the tabloid-sponsored reward poster and the officers posted at every entrance and breach in the Victorian railings, police tape woven in the gaps. Painstaking searches have been conducted throughout the 148-acre park, with shrubbery shorn to ground level. On the street, pedestrians either seek eye contact or avert their gaze and cars pass at a funereal pace. It may be my imagination, but there’s a tension in the air, a heightened sense of alert. But this observation was undercut earlier today when, while talking with an officer on duty on Langside Avenue, we were interrupted by a local resident driving a Range Rover, clearly peeved to learn that the park will remain closed until further notice. 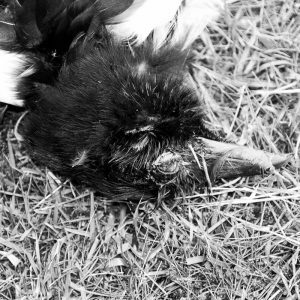 A dead magpie is said to signify malicious talk. The media coverage is wrought with factual inaccuracies and contradictions. Early speculative reports went for the jugular, the easy and most obvious assumptions. The victim is a prostitute, screamed one forum, the victim is a drug addict, the victim is a foreigner. Yet in the national media the story barely warranted a mention, focussing more on the stabbing of a London teenager, Arsema Dawit, whose death is no less a tragedy. 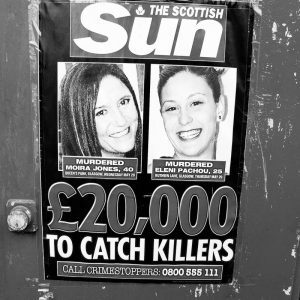 However in Glasgow, almost 24 hours later, a second murder took place, that of a 25-year-old Greek restaurant worker, Eleni Pachou, in a Ruthven Lane pizzeria in the city’s West End. 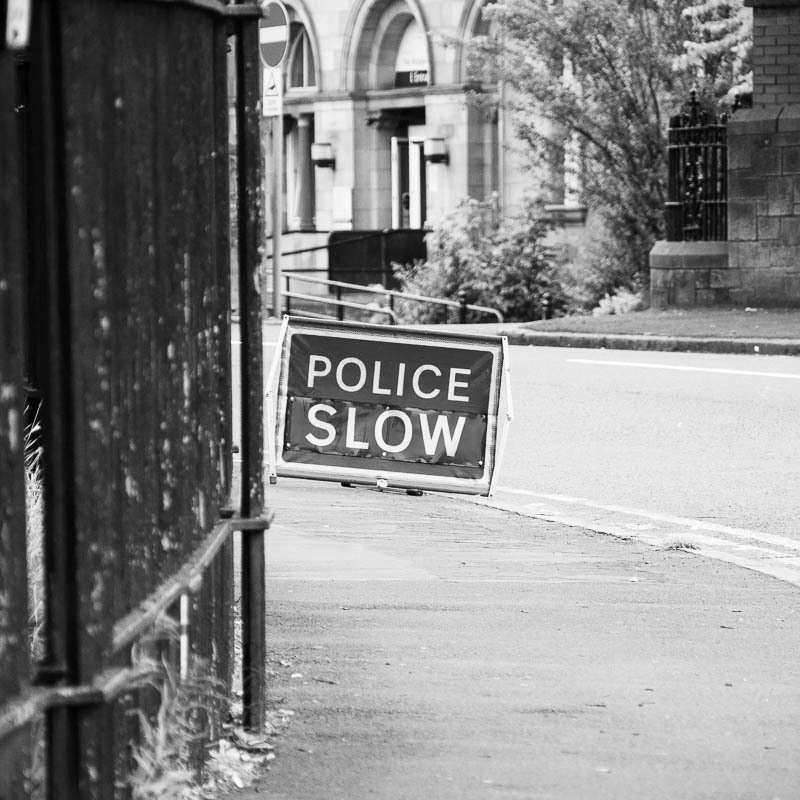 Two days later, a third murder occurred when a 27-year-old man was fatally assaulted in Shawbridge Street, an incident going virtually unremarked. These events came only a week after a 47-year-old woman was shot in New City Road, and six weeks after a 43-year-old woman was raped on the site of the newly-constructed Victoria Infirmary, close to Queen’s Park. 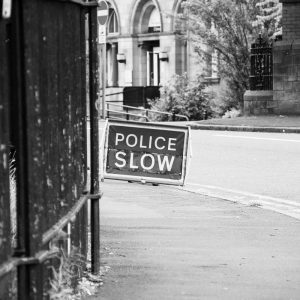 Reports on Moira Jones’ killing state that when police first arrived at the scene, onlookers concluded that their presence was fictional, that Scottish Television was on their doorstep to shoot an episode of Taggart – its unofficial strapline – there’s been a murder. Once, while working on a film in a Soho facility house, I recall hearing this line, chanted again and again by one of the post production operatives. To my sensitive Glaswegian ears, it was a bizarre, vaguely offensive mantra. There’s been a murdurrrr. Turns out the early speculation was wrong on all counts. The victim was not a prostitute, a drug addict or a foreigner. Moira Jones was a 40-year-old English woman, a sales consultant for a soft drinks company, who for five years had lived on her own in a flat on Queen’s Drive, directly overlooking the park. Much mention has since been made of how the victim was ‘respectable’ and how the area is predominantly middle-class, as if to suggest that the murder is all the more tragic by dint of perceived privilege, the inference being that it’s okay to kill or be killed in the city’s less salubrious parts. Moira Jones spent her last fatal night north of the river in Cranstonhill, visiting her boyfriend before driving home in her black Rav 4, returning at around 10.45. From this point the facts become elusive. 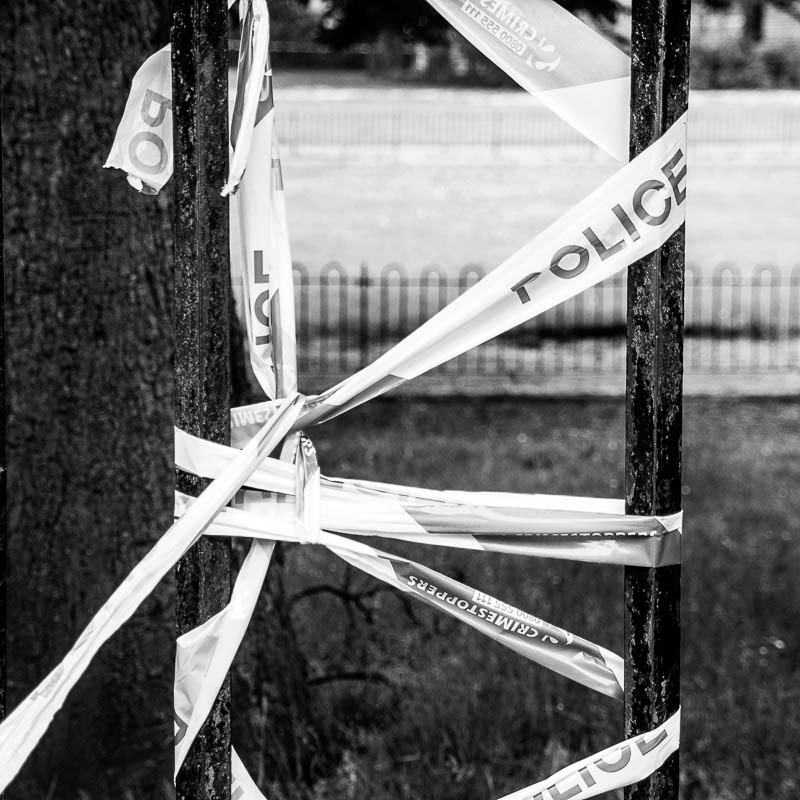 She may have been attacked on the triangular grass verge close to her flat where items of makeup and part of a handbag strap were later recovered. There may have been a struggle as she fought off her attacker before being dragged 300 yards to where her body was found, partially clothed and brutally beaten, by a park ranger at 9.45am on May 29. If a city could take part in a police ID line-up, surely Glasgow would be hauled out as the main suspect. Such is its reputation. Historically the city is a place of violence, the clichéd murder capital of Western Europe, the No Mean City that for over a century has acquired and retained mythic status as an ugly, bloody and murderous metropolis. 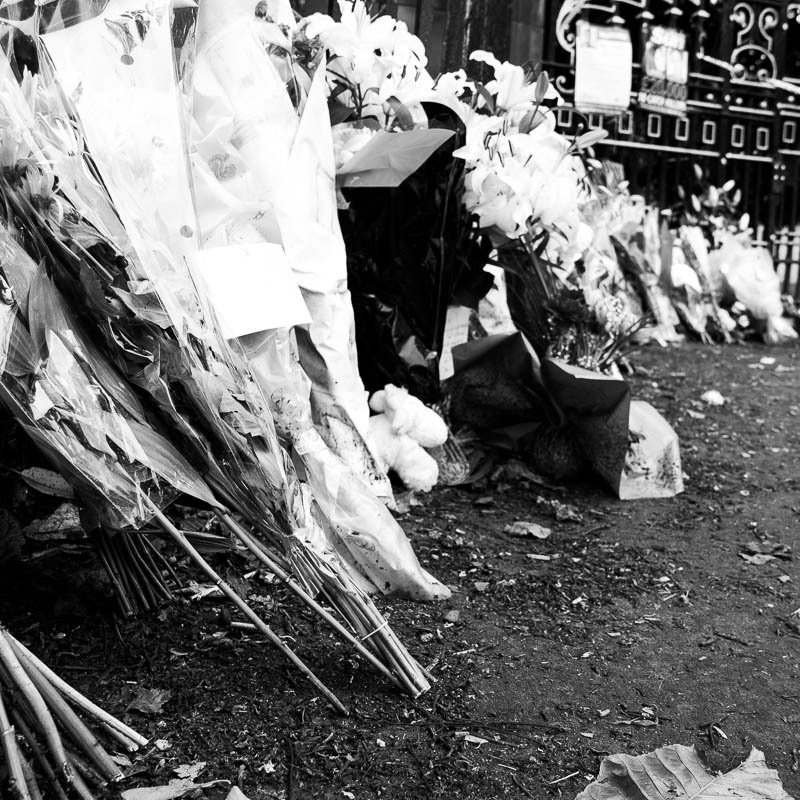 And while murders occur in every city, unlike Manchester, London or Leicester, Glasgow reigns unchallenged in our collective psyche as irredeemable, the place most likely to be beaten, stabbed or shot. It’s a charge about as plausible as a Taggart plot and sadly just as perpetual. 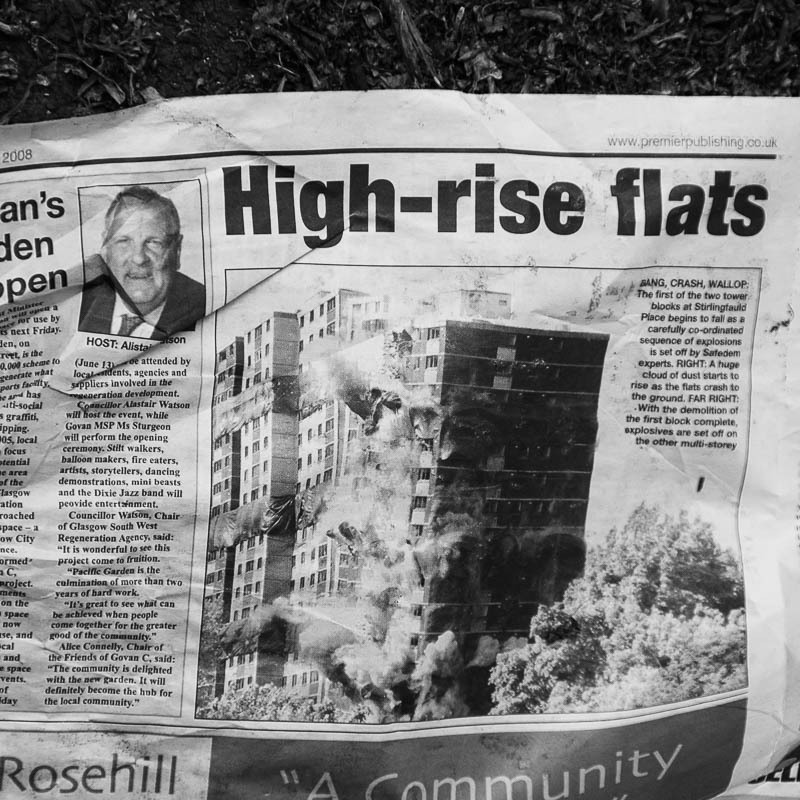 Walking the short distance home, I’m caught by a stray page of a newspaper, showing a photograph of the Stirlingfauld flats being razed to the ground in a controlled explosion. Another violent end of sorts, I concluded, but unlikely to be mourned by many. Thanks for your comment. I think you mean May 2008, not 2018. Hard to believe it’s almost a decade since Moira’s death.